I had fun making this New Home card (Ah, who am I kidding? 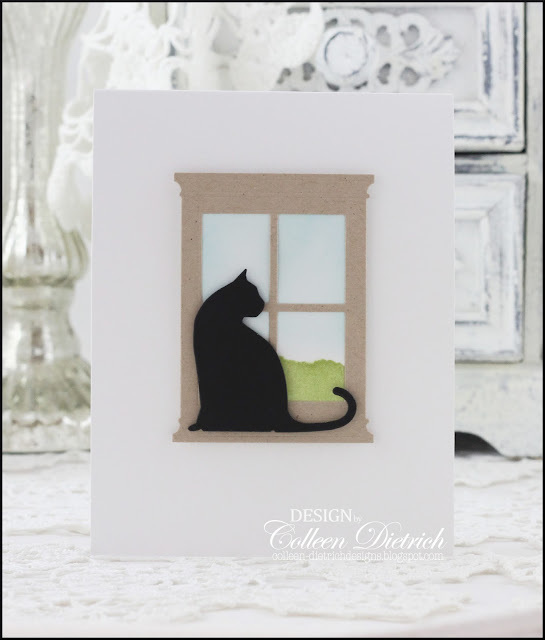 I have fun making ALL cards, even if they don't turn out the way I want them to!). 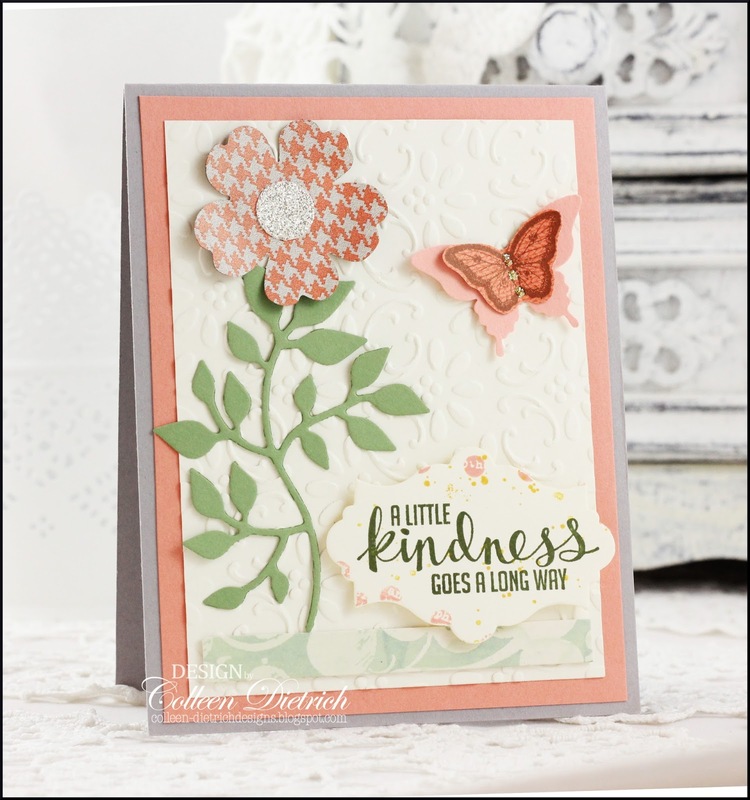 It gave me a chance to use the new-to-me Hardwood background stamp from Stampin' Up! 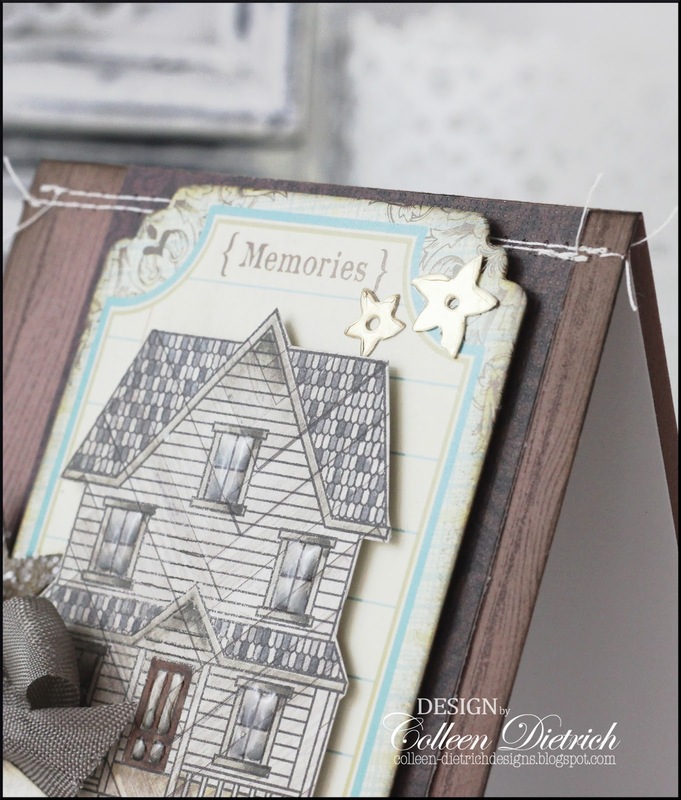 I added loads of little details on here: a house from Boards & Beams by Papertrey Ink, stamped on hardwood patterned paper, then colored in tones of warm gray with Copic markers. All windows were touched with Glossy Accents. There's a chipboard star, coated in glitter and topped with a tiny punched heart. 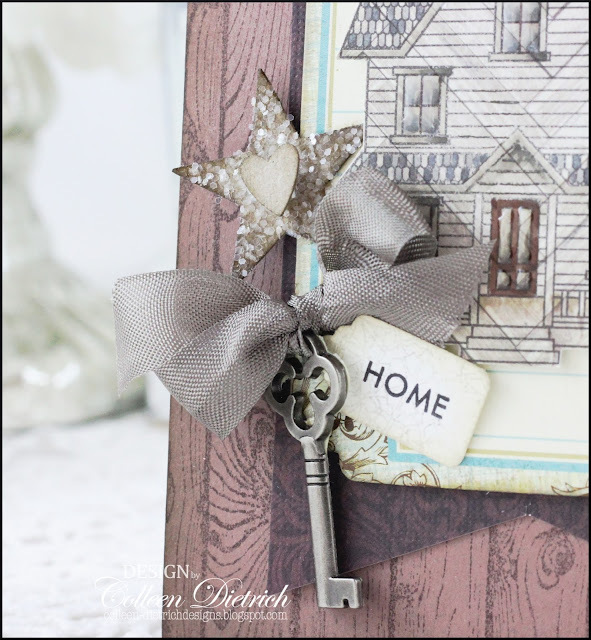 Oh, and a metal key from Tim Holtz, attached with Hug Snug seam binding, with a little sentiment tag dangling alongside it. I got out my sewing machine to attach a brown damask banner (paper from Graphic 45), and in the pic below you can see little gold flowers. They were trimmed from a Memory Box Flowering Christmas Tree die cut, cut from gold cardstock. Enjoy your day, and thanks for coming by! 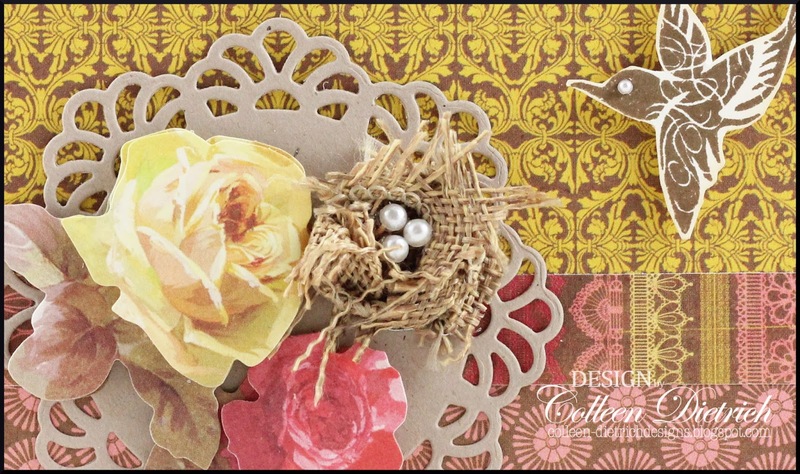 Stamps: Boards & Beams - Papertrey Ink; sentiment - Owl Be Thinking of You - The Craft's Meow; Hardwood background - Stampin' Up! 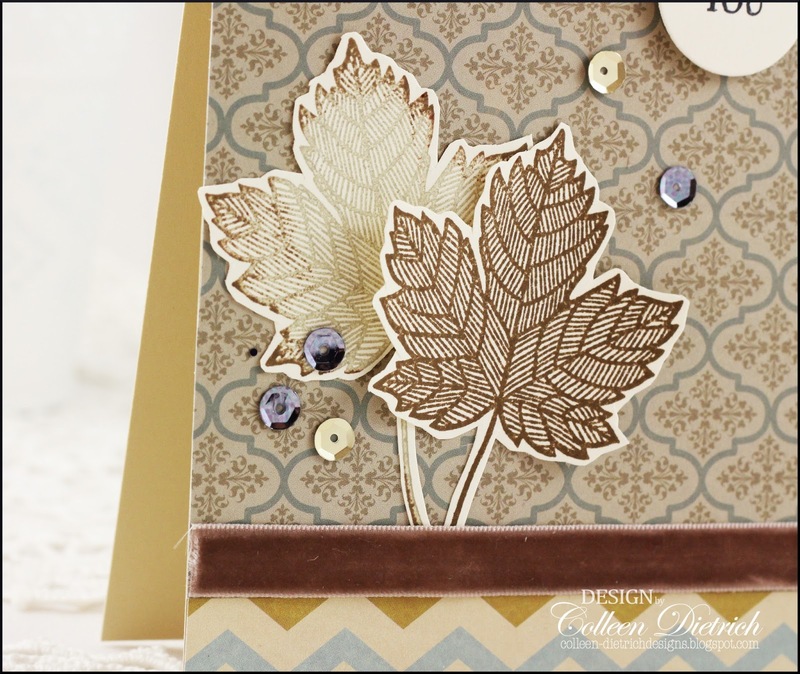 Paper: Close to Cocoa - Stampin' Up! ; brown damask pattern - Graphic 45; hardwood pattern (house stamped on it); cereal box chipboard (star); gold metallic - WorldWin Ink: Memento Tuxedo Black - Tsukineko; Chocolate Chip - SU; Old Paper, Frayed Burlap, Walnut Stain - Ranger Fibers: Mottle Brown seam binding - Hug Snug - The Zipper Stop Accessories & Tools: metal key - Tim Holtz; Glossy Accents - Ranger; Copic markers; clear glitter, small tag punch - Martha Stewart; star punch - Fiskars; Flowering Christmas Tree die - Memory Box; memories journaling die cut - Colorbok; heart punch - Heart-to-Heart punch - Stampin' Up! "May your hearts know only happiness from this day forward." Isn't that lovely? 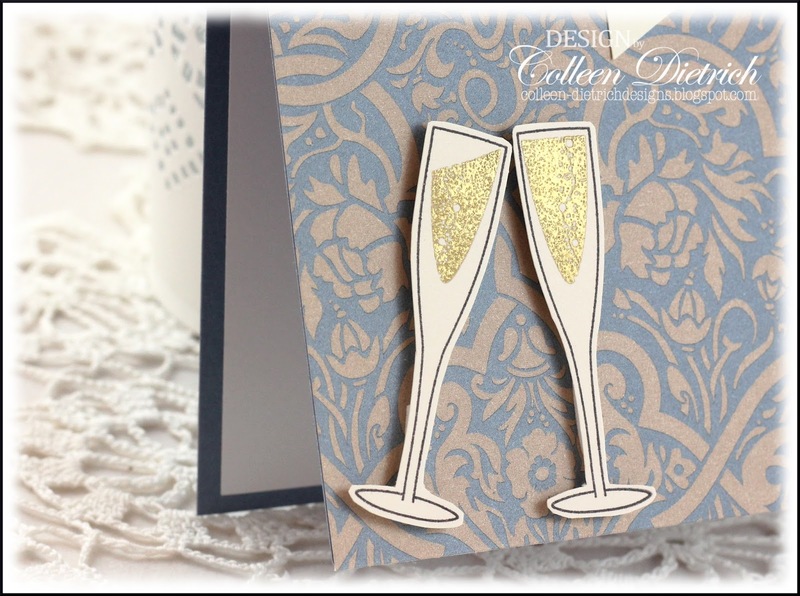 It's a sentiment from Papertrey Ink's Propose A Toast set, perfect for engagements and weddings, and even anniversaries. Quite versatile, I'd say! I used gold embossing for the champagne, or white wine...whichever you prefer. I like both! The damask paper and Bordering Blue card base are retired stuff from Stampin' Up! I love new stamps and papers, all kinds of new goodies to play with...but I really enjoy using my older stuff, too. I know I am not alone in that! 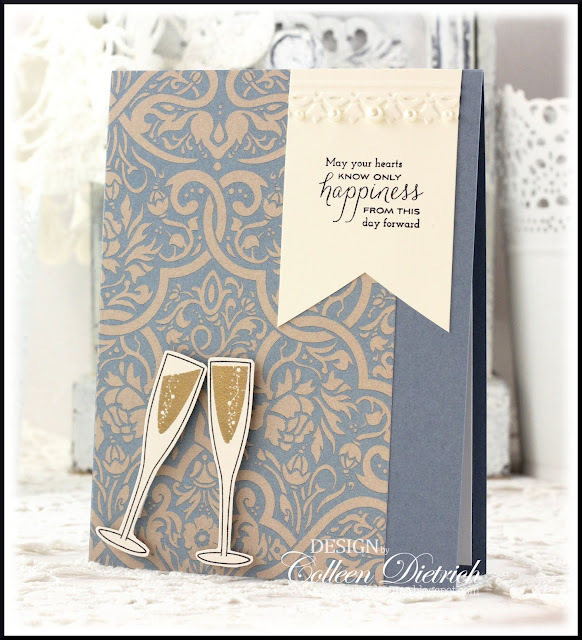 Stamps: Propose A Toast - Papertrey Ink Paper: Vintage Cream - Papertrey Ink; pattern, Bordering Blue - Stampin' Up! Ink: Memento Tuxedo Black, Versamark - Tsukineko Accessories & Tools: gold embossing powder - Stampin' Up! ; Framed Tulip embossing folder; pearls - Queen & Co. 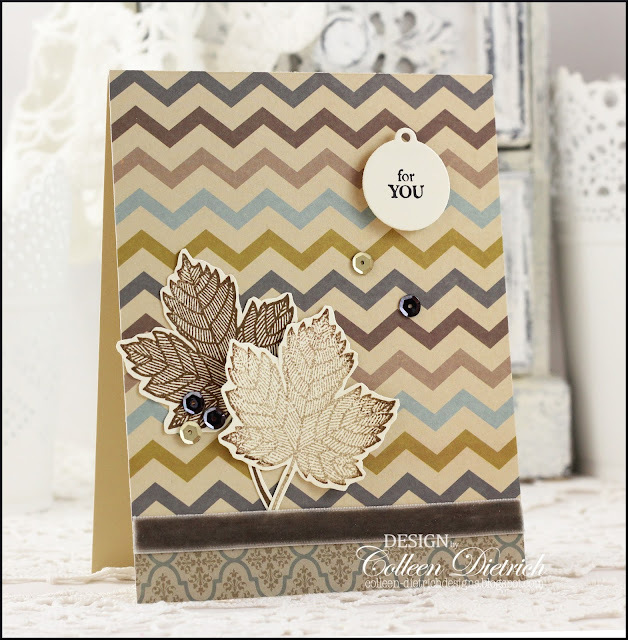 Sometimes, you just need a simple card, but still want it to have a little pizzazz. 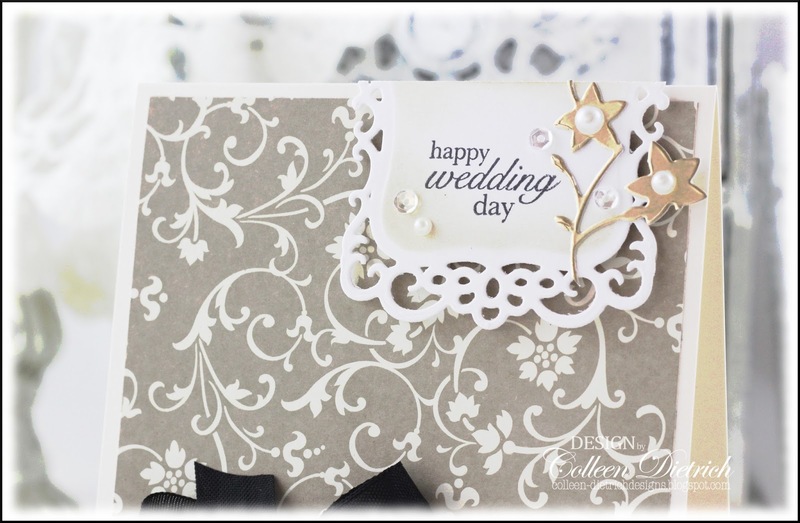 I added a few details that took this from plain to a-little-better-than-plain: bright yellow punched flowers, topped with yellow gems, and a stitched rectangle die cut for the sentiment (Verve). I rounded the bottom corners of the card, too, though it's maybe a bit tough to see it here with all this white. Thanks a bunch for coming by today! This card was easy-peasy to make, thanks to the $1.00 Scrap Bags I'm still working from, after all these years. 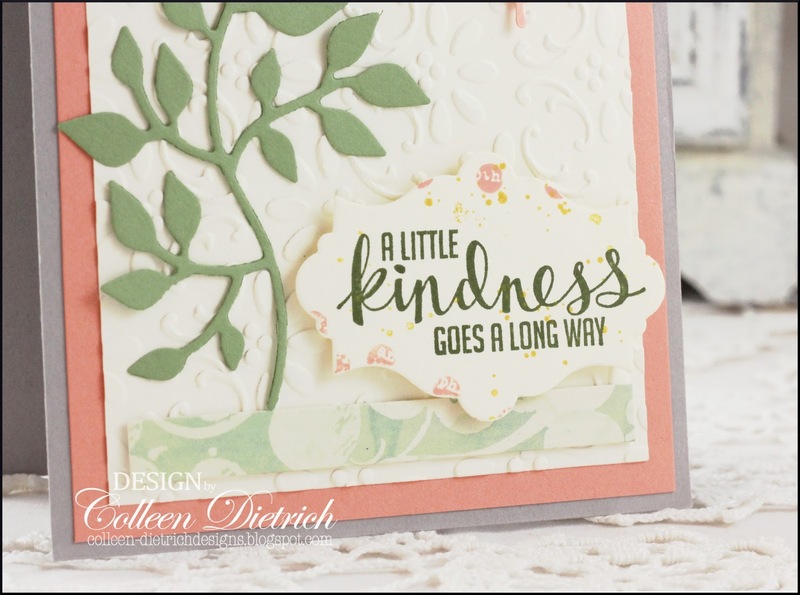 Big thanks to my AWESOME Stampin' Up! 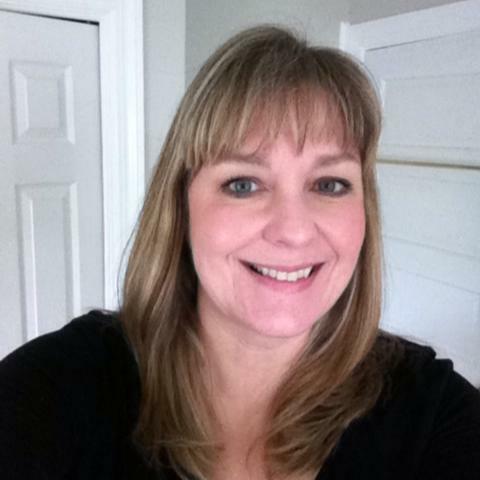 demonstrator, Gail Murray! 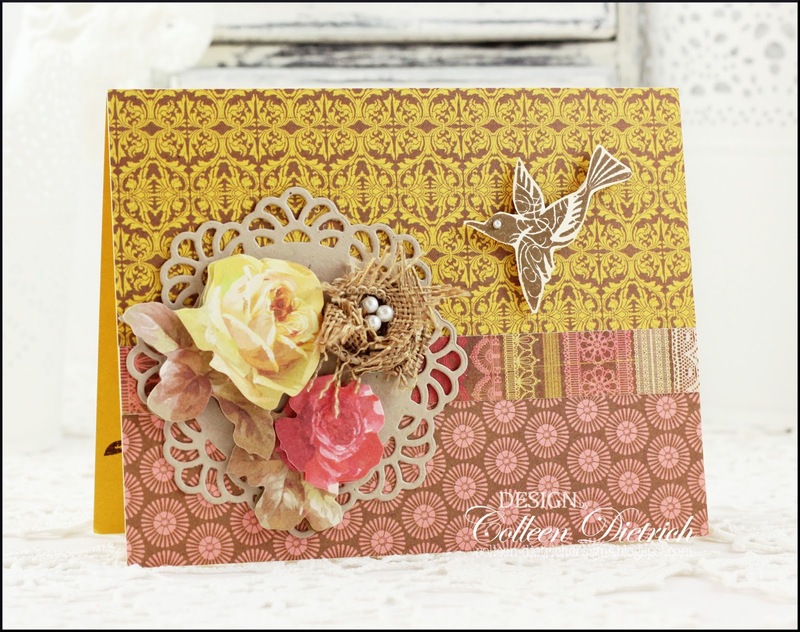 The embossed panel, the sentiment / die cut, the butterflies, the flower, the strip of patterned paper at the bottom....all from the scrap bag. I die cut Branch With Leaves / Sizzix, and assembled everything on a card base of pale gray, topped with a panel of Groovy Guava. That houndstooth flower makes me happy. It's got a silver glitter center. Wow! Haven't seen a blossom like this in nature. Thanks so much for coming by, and I hope you have a TERRIFIC week! I truly love using bits and pieces of things leftover from other projects, to turn them into something new. Such is the case with today's wedding card. The sentiment panel was cut in two, and I saved the other half for a later project. After sponging on some subtle ink, and then stamping the Papertrey Ink sentiment, I added sequins, pearls, and pretty gold snippets of a Flowering Christmas Tree die (Memory Box). Those tiny metallic gold accents really did it for me! The papers were collected long ago at a Stampin' Up! Retired Stuff Sale at my demonstrator's house. The bottom black panel has flocking on it -- love the tactile dimension it adds to the card. 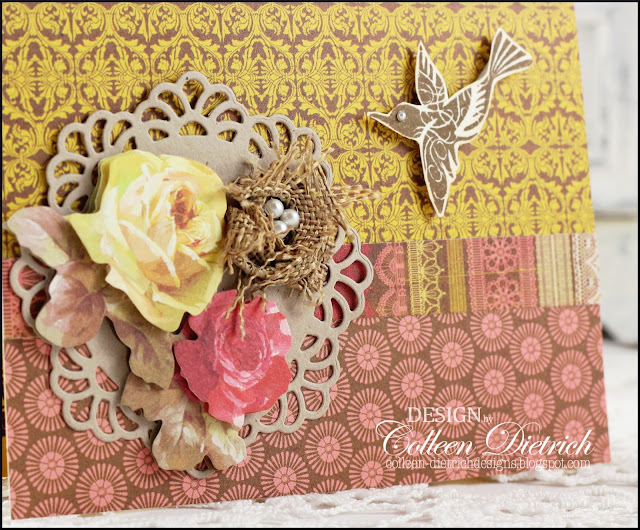 The patterned papers I used on today's cards come from a Hampton Arts / Ki collection called Metro Garden. It was a good deal from Tuesday Morning. Only problem with Good Deals is that they all want to come home with me. :-) I have sworn off visits to Tuesday Morning for months and months now. I know if I visit, more paper pads will want to jump into my shopping cart, and I sure don't need any more patterned paper! Oy! 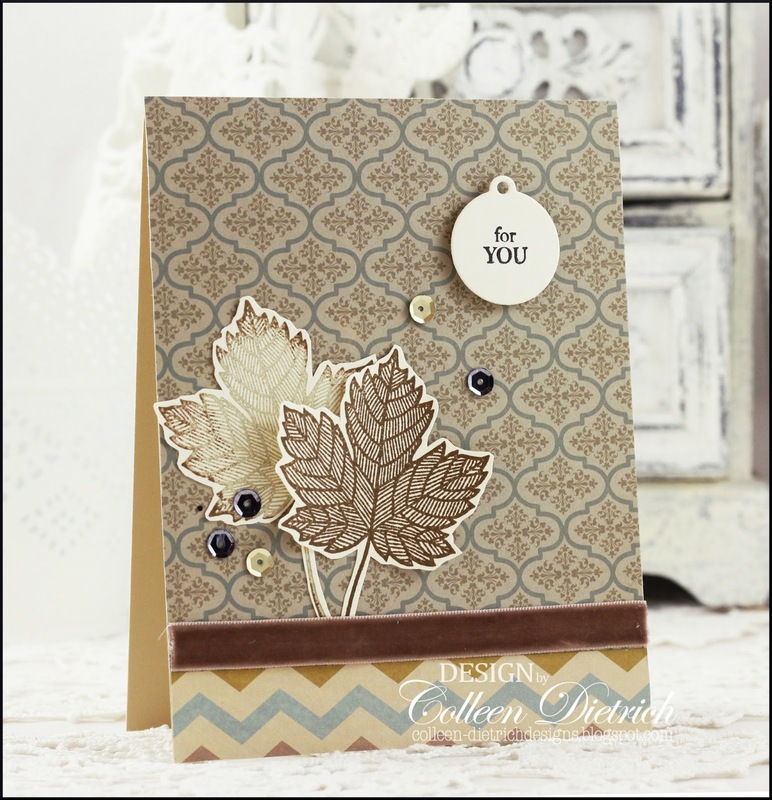 I thought these papers were very handsome, so I paired them with Magnificent Maple leaves from Stampin' Up!, some velvet ribbon, assorted gray and gold sequins, and a small sentiment. It's driving me crazy that I cannot find where this sentiment came from! 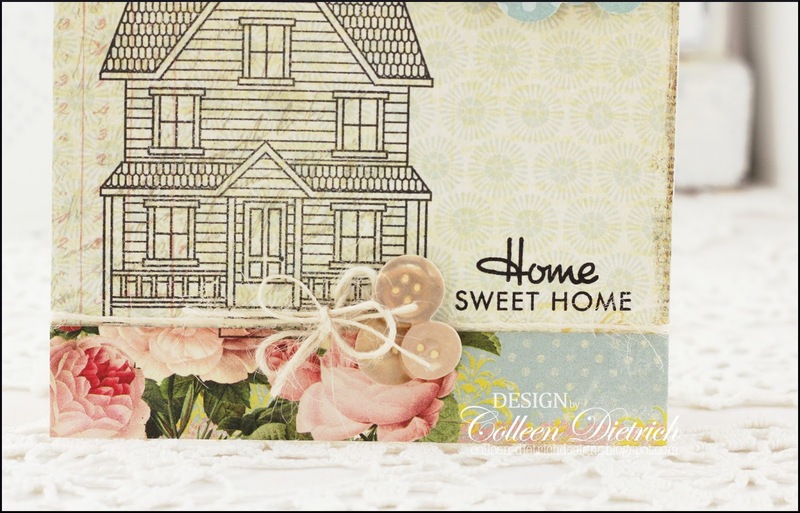 I made the cards months ago, and even though I use Evernote to catalog all of my stamp sets (and paper pads, and seam bindings, and sequin colors, and dies, and punches! ), I still can't find the darn thing. 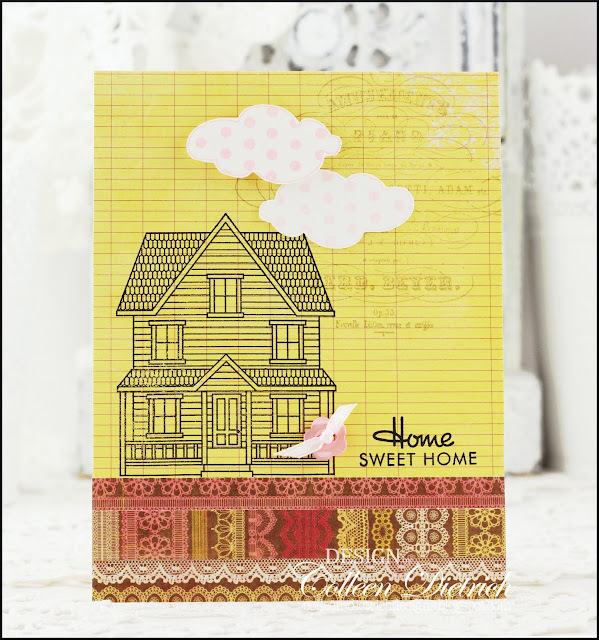 Not long ago, I made two New Home cards using patterned papers from Pink Paislee's Sweetness collection. My favorite is the one above, with those pink cabbage roses under the house. 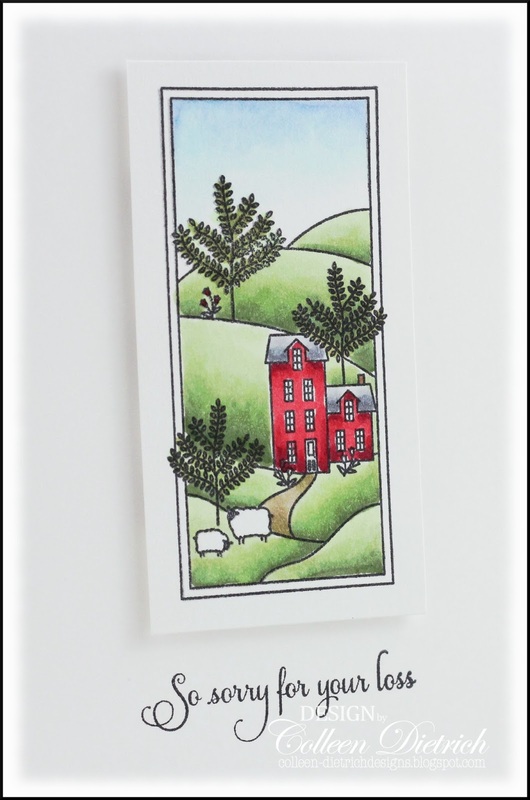 I used a favorite stamp set of mine on both cards, as well: Boards & Beams by Papertrey Ink. The images are great for coloring, but I also like them uncolored. There's plenty of detail to keep them from looking bland. Stamps: Boards & Beams - Papertrey Ink Paper: patterns - Sweetness - Pink Paislee; blue polka dots (clouds) - Stampin' Up! 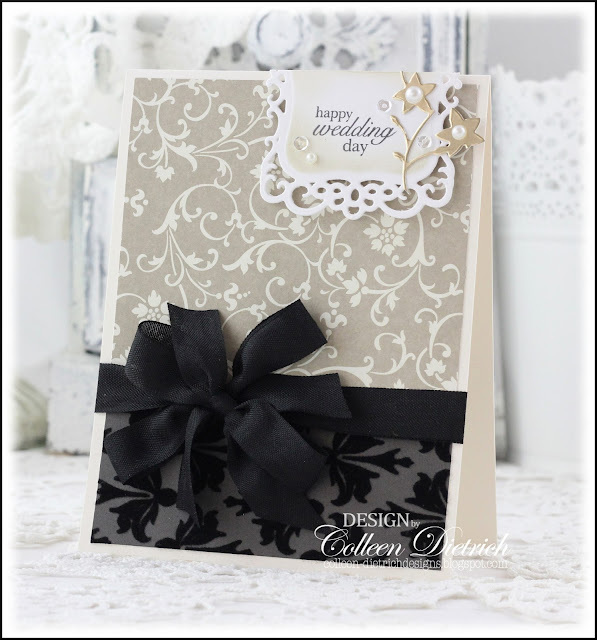 Ink: Memento Tuxedo Black - Tsukineko Fibers: natural twine - American Crafts Accessories & Tools: Cloud 1 & 2 dies - Papertrey Ink; paper button sticker - K & Co. The next version uses a different colorway, also included in the Sweetness collection. The ledger look to the yellow paper made a neat backdrop, but I added something subtle to it. See the faint words, like an old-time advertisement, near the top right quadrant? That's a stamp from Pink Paislee's London Market / Vintage Impressions set. I used Frayed Burlap Distress Ink for it, so that it is just ever-so-slightly noticeable. I added a sweet little pink button, tied with pink ribbon, to give it that little extra something. 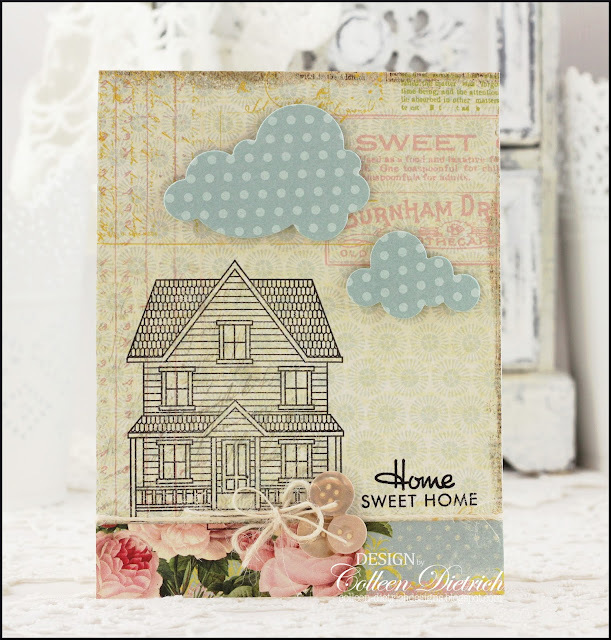 The clouds are from Inspired By Stamping's The Sky's The Limit, stamped in two shades of pink and trimmed closely. 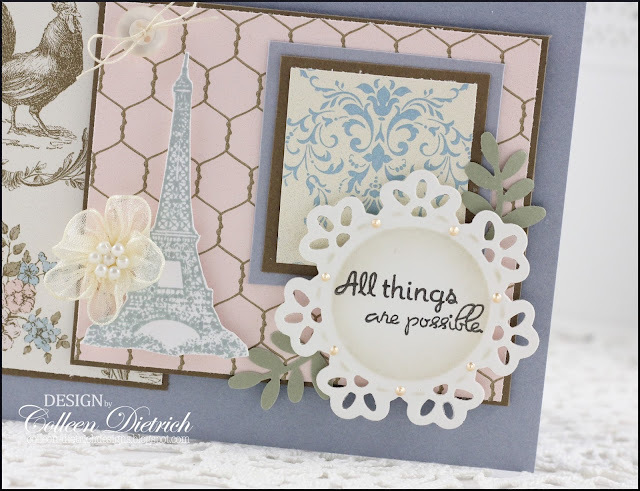 Ink: Pretty In Pink, Pink Pirhouette - Stampin' Up! ; Frayed Burlap - Ranger; Memento Tuxedo Black - Tsukineko Fibers: pink ribbon Accessories & Tools: Cloud 1 & 2 dies - Papertrey Ink; pink flower button - Stampin' Up! 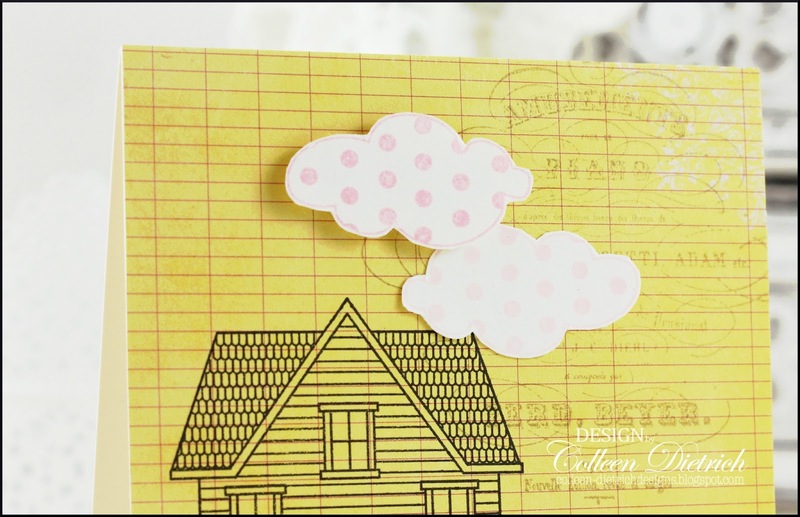 ; paper button sticker - K & Co.
Hello! We're baking here in NJ: not in my kitchen, but outside. Man, is it hot! 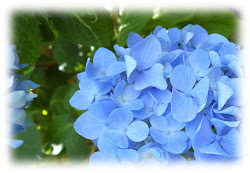 This morning, before the heat became too unbearable, I spent some time weeding, deadheading and watering in the garden. Then, because I'm just plain ol' crazy, I cleaned all the windows on the bottom floor of our house. My girls helped a little, and I am grateful for that. We have tilt-in windows, the ONLY way to go, as far as I'm concerned! Makes the cleaning job much easier. Speaking of windows, how about this paper version? Looks like our Cristabel, peering outside! 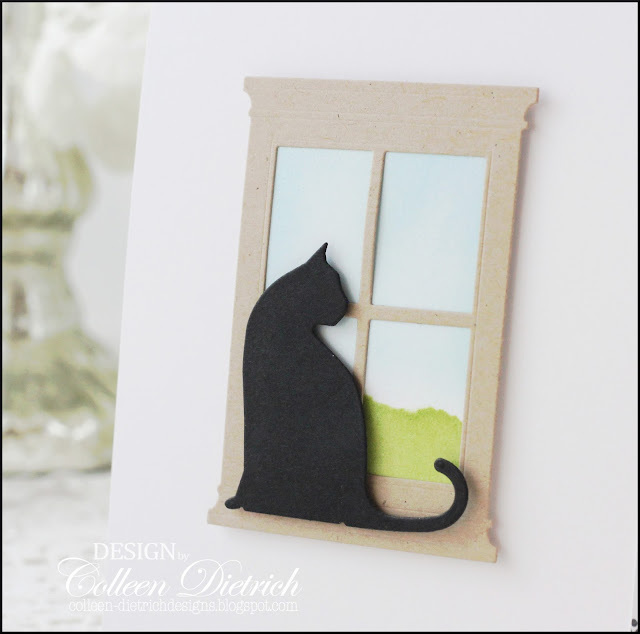 I used a Memory Box Madison Window die, and backed it with a plain piece of white cardstock that had been sponged to resemble grass and sky. 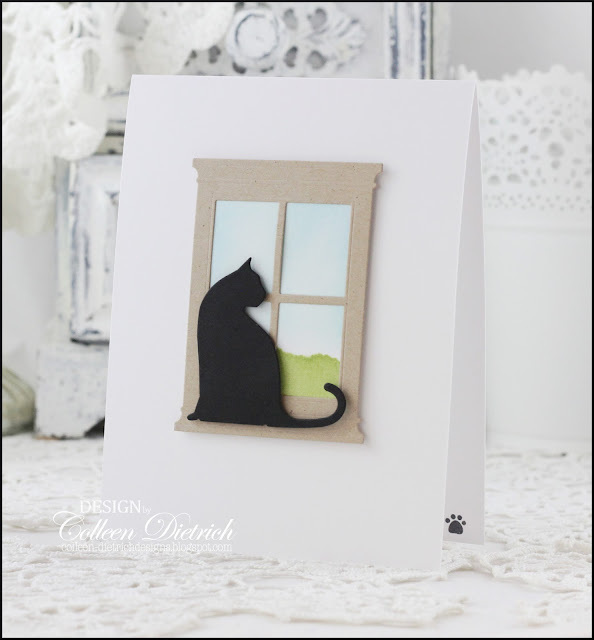 See the tiny pawprint inside the card? I always like to stamp something in the card, and then do a matching image on the envelope. Hope you're keeping cool, wherever you are! Boy, this was tough to photograph! On this wedding card, there is lots of white, and only a touch of gray ink. 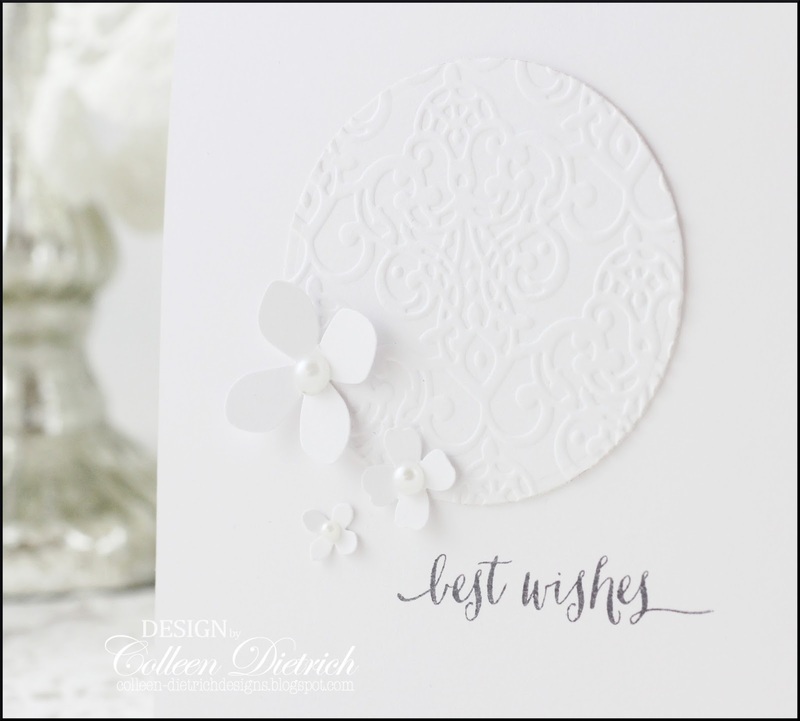 I layered a white, embossed circle die cut on the card base, and accented it with punched white hydrangeas, topped with pearls. By the way, when I add pearls or other gems to something that is not flat, I use a touch of glue to help secure it, even when it already has sticky stuff on the back. Two faves of mine: Ranger Multi Medium Matte, or Aleene's Quick Dry Tacky Glue. 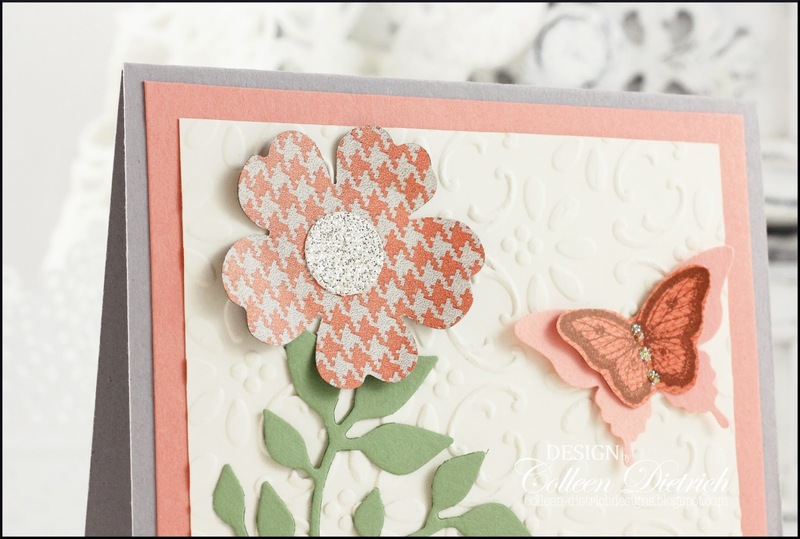 On a Soft Stone card base, I layered black and white flower die cuts from a $1.00 Scrap Bag, added red iridescent gems (on clearance at Michael's...yesssss! ), and an Avery Elle sentiment from a Christmas set. Pretty sure I've got the 'simple' part nailed down! It's a rare sight here on my blog. 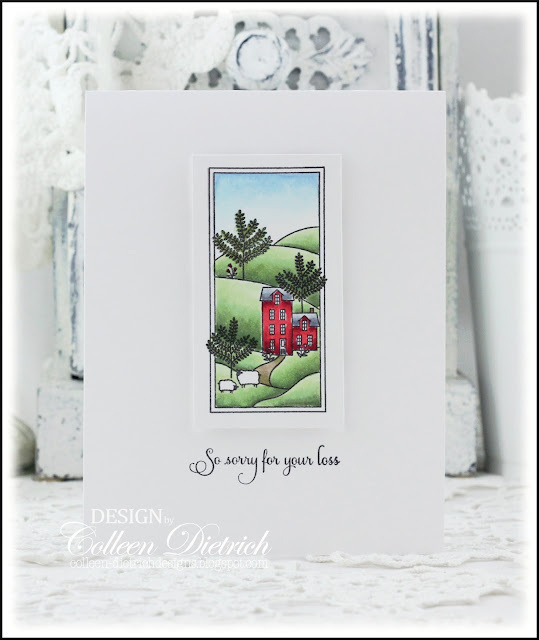 This is the second shaker card I ever made! If you missed the first, check it out. It's the second card in the post. They're not difficult to make, but they take a bit of extra time, and often, I'm in too much of a hurry to do it. 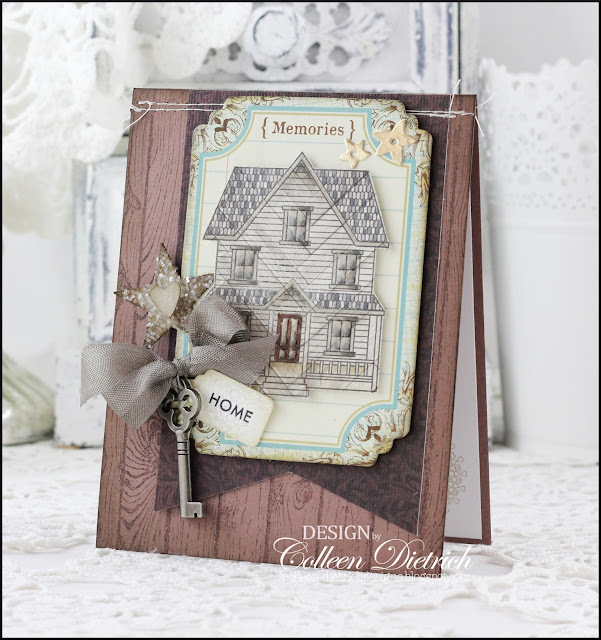 The Simon Says Stamp Stitched Circle dies were used here as the frames. After popping the smaller one up on foam dimensional tape, I didn't like the look of the card from the side. The foam tape looked really messy, and so I wound hemp cord around the frame twice, tying it off in a bow to one side. 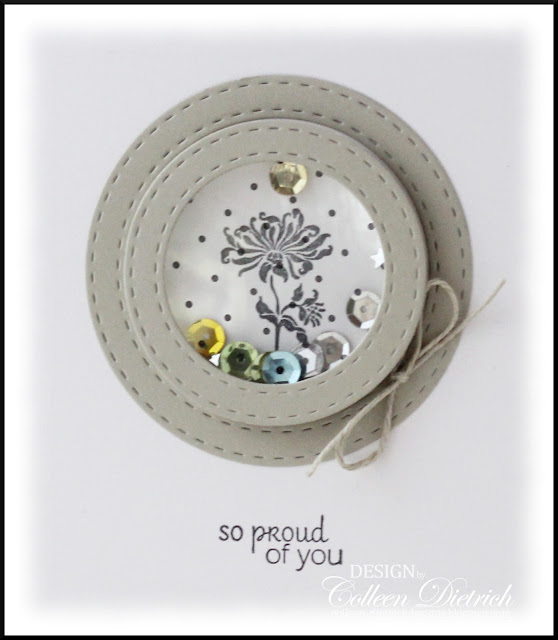 On a smaller white cardstock circle in the back of the frame, I stamped Bella's Bloom from Stampin' Up! The 'window' is a scrap piece of acetate with black polka dots on it (found in a $1.00 Scrap Bag). The sequins are nothing fancy, culled from my kids' art stash from when they were younger. I'm glad you came by today. Thanks for your visit! I made this sympathy card for someone sweet, who is helpful and kind, and such a lovely human being. She lost too many loved ones in a fairly short span of time, and it left her feeling empty inside. A simple sentiment, also from PTI, is all the card needed. I like the clean, spare look of the card, and hope my friend did, too.